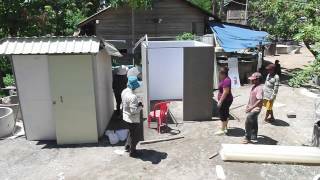 Earlier this year, our social business WaterSHED Ventures launched the Paradise Toilet Shelter – the first mass produced, quick-install shelter in the rural Cambodian market. The research, design, and production took nearly two years, after hundreds of consumer interviews, focus groups, and prototyping exercises. In March, the first batch of shelters came off our production line. Since then, the team at Ventures has moved quickly to introduce the shelter to consumers in several rural provinces. But the team is not starting from scratch. Over the last six years, WaterSHED, the company’s parent NGO, has been working tirelessly at building the market for sanitation, honing the right marketing messages that would motivate consumers to invest in a toilet, and building a supply chain of local businesses across the country. This has resulted in more than 180,000 toilet sales over six years. Ventures is leveraging on what WaterSHED has built by partnering with established local toilet businesses to offer customers a bundle package – the successful toilet core with the new Paradise Toilet Shelter. Furthermore, Ventures is utilizing WaterSHED’s well-tested iterative design methodology to create effective marketing messages to reach early adopters. One of those early adopters is Mrs. Chen Nen – a vegetable and rice farmer living in a simple wooden house in Tbong Khmum province north east of Phnom Penh. She lives with her husband, younger son, and two grandchildren. Her three eldest daughters work at a garment factory in Phnom Penh and visit during the holidays. Initially, Chen and her family began saving for a 2-room, custom-built brick unit. A wall would have separated the toilet from the shower. But the family was months, if not years, from reaching their savings goal when a sales agent approached them about the Paradise Toilet Shelter. The cement-board shelter was within Mrs. Chen’s budget, the space was large enough for Chen’s family to use it as both a toilet and shower, and the model could be installed in an afternoon. To make the purchase, Mrs. Chen received extra financial support from her daughters. Just before Khmer New Year celebrations in mid-April, Chen and her family had their toilet installed – their first ever. A three cement-ring water reservoir attached to the structure allows for Chen and her family to shower, wash clothes, and flush the toilet – a multi-purpose model customized to the family’s needs. Chen is thrilled with the purchase. “We installed the toilet on the same month that our village was connected to the electrical grid,” explains Chen, adding that her children can now go to the bathroom safely at night.